Author Written by Cleo Isco and last updated on Posted on May 22, 2017 . Posted in Categories SAP Certification FAQ. How to get SAP certification for free? 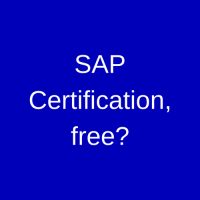 Although there is no such a thing as free SAP certification, let’s discuss existing opportunities to avoid the obligation to pay for getting certified in SAP area. Many people would like to pass SAP certification for different reasons. It adds value to one’s resume, it is required by some companies (usually, SAP consultancies) for promotion to a higher position, and it is also sometimes required by recruiters for application to certain vacancies. The first and the most straightforward option is to get sponsored for passing SAP certification by your current employer. In this case, SAP certification will be free for you because all the costs will be covered by your company as long as you can get it approved by your boss. The downside of this option for getting free SAP certification is that not every employer will be ready to pay for your certification and you might have only one attempt to clear it. Meaning that if you don’t pass it from the first time, next time you will need to pay for registering to the exam from your own pocket. The second option is not so straightforward and not many people know about. I also didn’t know about it for long time and only recently found out about such a possibility from one of my colleague. This colleague was from France and he told me that he could get tax credits to claim a tax reduction for his expenses on professional training and certification. The main requirement was to demonstrate that this training or certification were directly related and necessary for his profession (SAP consulting). Tax laws are different in every country, so I decided to check if it is possible to claim a similar tax relief in the UK. My findings were that it is possible to reclaim tax but you need to be self-employed (contractor). Since a considerable number of SAP consultants work as contractors, they are able to reduce their taxable income to cost of SAP certification. However, if you are not self-employed but rather employed by some company, then it seems like expenses on SAP certification cannot be compensated by the tax reduction. So, it is different from France. As I wrote earlier, every country is different and has different tax regulations. You might not be able to get any benefits from your government that will enable free SAP certification. The main message here is that you should check what are the rules in your country. You just might not know about tax benefits that your government offers to people who are eager to develop professionally and drive the economy forward. So, my advice is that you shouldn’t miss on this opportunity of getting sponsored for passing SAP certification and do some quick research. Good luck at the certification! My son has completed SAP Technical Support with EOH Mthombo with a 1 year learnership. How do we obtain SAP Accreditation? Did you gave your SAP certification, how was it? I am planning to give one soon. So could you help me please? What should I focus more on, any material or links you have would be appreciated. I have completed BBM, MBA HR. But I 40 year old n I am fresher to HR DEPT. how worth if I want to opt SAP n what would be the total cost. I want to know your SAP partners here in my country Nigeria. I wish to enroll for free SAP HCM/HR Course,hence requesting you to plz provide me complete details for the same. I am MBA in HR and have 10 yrs of work experience in this domain. Currently, I am not working and want to enhance my skills and knowledge by pursuing this SAP HCM/HR course from you. Kindly help. Thank You???? Hi, I am interested in learn SAP basically Financial modules and obtain the certification. So how much it costs ?, How long it takes ? I am Althaf Basha from tamil nadu( chennai). How I learn about SAP ABAP Coding in Chennai .. please tell me.. I am interested in the SAP FICO, I would like to know how much it cost and the duration. Previous Previous post: How to Choose SAP Module?